Green Home Builder: With the 2019 Building Energy Efficiency Standards, there are increased standards such as solar photovoltaic systems for new homes. What are other additions to standards for residential buildings? 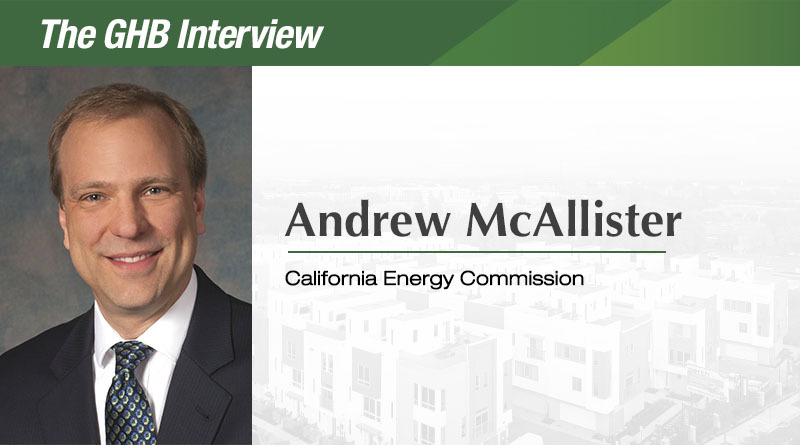 Andrew McAllister: The 2019 Building Energy Efficiency Standards take effect on Jan. 1, 2020, and focus on four key areas: smart residential photovoltaic systems, updated thermal envelope standards (a tight and well-insulated building shell), ventilation to ensure high air quality, and nonresidential lighting. Together, these measures ensure that indoor spaces both protect the health of occupants and use less energy than comparable older buildings. These standards also encourage demand-responsive technologies, including smart controls, thermal storage, and batteries. Additionally, the standards give the all-electric home its own compliance pathway, independent from that for dual-fuel homes. All of these elements benefit the homeowner and ensure that buildings contribute to the resilience of the distribution grid itself. This Part 6 update represents an important step for consumers and helps to achieve California’s energy and climate goals. GHB: What can builders do in 2019 to better prepare for the standards for 2020? AM: We love it when builders get in touch and get involved, whether via the CBIA or directly with the Energy Commission. The Energy Commission hosts several resources for builders on the standards. Our Online Resource Center has training materials broken down by topic. The videos, brochures, and fact sheets help the building community and enforcement agencies understand how to comply. We periodically host training sessions and also work with Energy Code Ace and the utilities to provide more training opportunities. In addition, we have an Energy Standards Hotline to offer one-on-one help (toll-free in California – 800-772-3300 or Title24@energy.ca.gov). Builders should also sign up for The Energy Commission’s free quarterly newsletter, Blueprint, to receive the most up-to-date information. GHB: There have been significant advancements recently in terms of green building and energy efficiency. What other projects are you working on this year to advance these goals? AM: This year we will focus on a number of policies to keep the state moving toward achieving California’s energy and climate goals. First we will update training and compliance materials for the 2019 standards. We will also turn our attention to the next update to the energy standards. The process will include workshops, meetings, and public hearings. The focus is on commercial buildings and multifamily housing. Apart from building standards, the Energy Commission plans to consider appliance standards for commercial and industrial air compressors, irrigation sprinklers, replacement pool pump motors, fluorescent light bulbs, and air filters. In 2019 we will be developing the update for the Energy Commission’s 2030 Energy Efficiency Action Plan, per Senate Bill 350 (doubling energy efficiency) and Assembly Bill 758 (energy efficiency in existing buildings). This plan will be the state’s primary road map for energy efficiency for the coming decade. Energy Commission staff and I will be doing workshops around the state to converse with stakeholders – listen to ideas and concerns – in order to ensure that the plan’s recommendations are well-conceived and implementable. We’re also funding applied research on a variety of topics, including low-carbon building technologies, community-scale sustainable building approaches, and interactive code compliance tools for designers and local governments. GHB: Although these standards will save money in maintenance costs long-term, some builders may worry about the initial cost increase. What advice do you have for those builders? AM: New homeowners with rooftop solar panels will be cash positive on day one, since monthly energy bill savings will be significantly greater than the amount added to a monthly mortgage payment for the solar installation. Homeowners or builders also have the option of using power purchase agreements or leased solar systems, which have little or no initial cost and still provide net savings because they offset the energy used in the home. The standards also include a compliance option for community solar programs developed by utilities or communities that wish to pool resources instead of installing solar on individual homes, and we are hopeful some creative thinking will go into those proposals. Finally, exceptions are provided for specific projects where adding solar would not lead to cost-effective savings, such as where there is too much shade or where the electricity rates are uncommonly low, reducing the value of on-site solar generation. Many builders are already building homes with solar panels and nine local entities already go above and beyond the 2016 Standards and have a solar ordinance. De Young Properties and ConSol have built a whole community in Clovis to demonstrate how zero net energy homes can be constructed affordably and marketed successfully. The project, funded by a grant from the California Energy Commission’s Electric Program Investment Charge, will help educate homebuilders in marketing and building strategies. GHB: How do you expect these new standards to affect the housing market in 2019 and beyond? AM: The Energy Commission does not develop housing policy and cannot predict what the housing market will do. What we do know is that new homes will be high-performing and will have reduced the overall cost of ownership compared to an identical home built under previous standards. Folks living in these homes will have more money in their pockets to invest in the things they value.